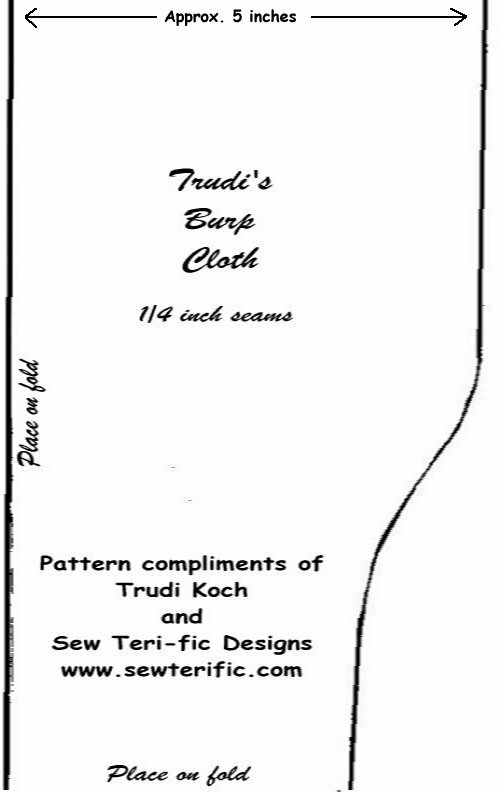 Trudi Koch sent in this picture along with the pattern and instructions for another great project! Click on the picture to view the pattern. Print the pattern full size in your browser (you may need to turn off margins and other printing options), then use the "Back" button to return to this page. 1/3 yard of flannel will make two burp cloths. Cut the 1/3 yd of flannel in half. Now you have a piece 12x22 inches. Make the design at one end, or if you like, one on both ends. To make a pattern for the burp cloth, I've sent 1/4 of the pattern in full size. I think you're clever enough to figure out how to make a full size pattern. If ya need help, let me know. Lay the finished flannel, with design, on the towel, right sides together. Now place the pattern on top and cut it out. This should fit across the towel's width. (You can get three cuts or burp cloths from one towel). Sew around the edges 1/4 inch seam, leaving about 4 inches open at the end with no design. Turn and press. Hand sew the opening or stitch on the machine close to the edge. Please drop her a note to thank her for this project! All design files and derivative works are Copyright 1998 - 2019 Sew Terific Designs. Feel free to embroider these designs for personal use or on items for sale. You may not transfer, sell, share, or post these design files or images of them anywhere without written permission. See www.copyright.gov or www.WhatIsCopyright.org for more information on copyrights.